Once a retriever of small game, it is now primarily a companion dog, although it is used in field trials even today. Many health problems have been weeded out by responsible breeders. the name Cocker is probably derived from the work which they used to to - that is retrieve woodcock from dense undergrowth. It is 13-15 kgs in weight and 38-41 cms in height. Casagold English Cocker Spaniels. We house beautiful dogs with bloodlines from around the world and rear our puppies with love to continue our lines and to pursue our passion of showing dogs. Our puppies are well socialised, have sound temperament and are toilet trained. They are likely to develop into healthy, well-behaved and good-natured adults. They enjoy quality food and clean surroundings in our home with a large garden. Puppies occasionally available. Click here to See Litter Box, and more details. We provide life-long support to the guardians of our pups and are always on the other end of the phone. PS: We don't encourage getting a puppy into a home till everyone is equally keen to have one, and the family is committed to giving them time every day. 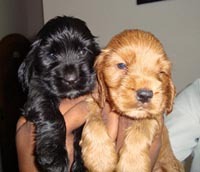 Rabrika Kennels offers an exciting litter of English cocker spaniel puppies bred out of the best imported lines in the country to the true breed enthusiast. Puppies are well socialised with wonderful outgoing temperaments and are vaccinated up to date and would come with KCI certificate and microchip. 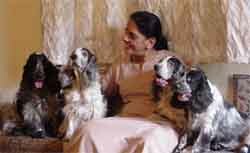 Rabrika Cockers is associated with the breed for over 18 yrs and has created a legacy for itself and we house the English Cocker Spaniel of the year 2006 & 2007 - BIS.Ind.CH.Tarrendayle Its About me (Imported Australia). We have the best lines from Australia, UK & Denmark. 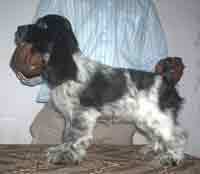 Click Here to See Litter Box, Pictures of Puppies, Sire, Dam and Pedigree Details. 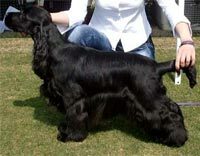 Home of Top quality Champion English Cocker Spaniels, presents Show Quality Puppies. Ch.Abirami's Cardiff (Ch.Jaspar's Adam- a top winning, multiple BIS winner x Ch.Morina (Ch.Bitcon Mystic Charm of Abracadabra x Ch.Abracadabra's Blue Witch). Ramp Walk Kennels Breeders of top quality English Cocker Spaniels offers for sale show quality puppies Sired by Ch.Kingsway's Kyna Manhatten (Imp.U.K.). 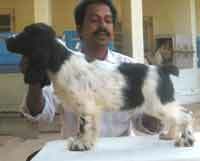 Please Click Here to View Pictures and Detailed Pedigree. Karthik Mudaliar offers excellent quality truly show specimen. 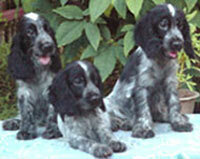 English cocker spaniel puppies. The puppies have been carefully bred. according to the standards for true temperament and quality. The puppies have been dewormed and vaccinated and been registered with the KCI. Click here to view the puppy pictures! The pedigree has got several champions. English cocker spaniel lovers always welcome. For enquiries and information about the puppies email or call Mr. Karthik Mudaliar. Email : urmacocker@gmail.com Ph: 09916444369.